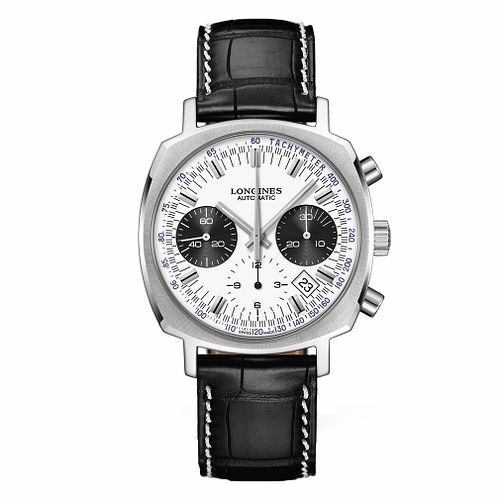 A men's black croc effect leather strap watch from Longines. Featuring automatic movement with a round chronograph dial with silver tone hour markers and watch hands, all held in a polished stainless steel case for a classic finish. Longines men's chronograph black leather strap watch is rated 4.0 out of 5 by 1. Rated 4 out of 5 by Anonymous from Wonderful watch, only ever so slightly flawed. This watch is gorgeous. The pictures online do not do this justice. The quality of build is tremendous and the design simple, but elegant. The only thing that stops me from rating this with 5 stars is due to the complexity of the face - whilst it looks stunning, I have to admit, it's difficult to glance at the time. Other than that, I love this watch.